Another in the series by Daiwa Silvercast-A Series Spincast Reel has lived up to its expectation of delivering quality, durable and efficient service to anglers. From recreational to sport fishing, the Silvercast-A Series Spincast Reel always comes in handy. It is appropriate for both average and light fishing activities. The Silvercast-A is made with a rigid aluminum alloy. It has three ball bearings, along with a Titanium Nitride pickup line, that protects the line from wear and tear and ensures a smooth operation. Its casting is very well done too. To ensure optimal performance, the Daiwa Silvercast-A Series Spincast Reel has an oversized line opening, along with a smooth disc drag with dial adjustment. To help us expose the excellent features of this reel, we have to look at the reviews of those who have actually used it in fishing for varying periods of time. Spincast anglers will also appreciate the soft handle that enables better comfort and safe hold. Daiwa spincast reel with medium-light action in freshwater. A fisherman who was looking for a light action spin cast reel for fishes less than 5 lbs. examined about four different types of spin casts including the Daiwa Goldcast and Silvercast, the Zebco Omega and Omega Pro. According to him, The Zebco Omega was too heavy, but he was surprised to find that the Daiwa Silvercast was cheaper and better than the Goldcast. For one it was lighter, it has a bearing on both the main shaft that keeps the spool in place and on both sides of the main gear, which is not on the Goldcast. Also, he does not like the clicking sound the Goldcast makes during retrieval. He went on to compare between the Daiwa Silvercast and the Zebco Omega Pro Z02, and chose the Daiwa Silvercast for two major reasons: While the retrieval angle on the Silvercast is 25″ per turn, that of the Omega Pro Z02 is only 14″ and the Silvercast costs only about 1/3 the cost of the Omega Pro. Furthermore, another customer who had owned many Zebco spincast reels said that he has been searching for a high performance brandable reel and decided to try out Daiwa’s Silvercast Reel. He adds that he was not disappointed given its high quality and durability. You now have a broader idea of the Daiwa Silvercast-A Series Spincast Reel in case you need to purchase it. 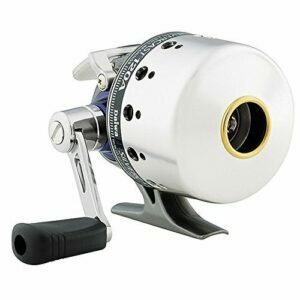 Since the Daiwa Silvercast-A Series Spincast Reel contains 3 ball bearings, this makes it very durable and stands out among its contemporaries. The Daiwa Silvercast-A Series Spincast Reel is appropriate for freshwater activities, and useful for both average and small angling action. With a weight of about 8.8 oz.the Daiwa Silvercast-A Series Spincast Reel is very light, meaning that carrying it around will not be an issue at all. Having a gear proportion of 4:3:1,the Daiwa Silvercast-A Series Spincast Reel is worth every penny because this value increases the efficiency of the reel. A few fishermen and other recreational users have complained about the drag of the Daiwa Silvercast-A Series Spincast Reel, which decreases after a few months or sometimes weeks. The Daiwa Spincast Reel is very expensive, in comparison to other spin cast reels in its category. At times when you forget to follow the right modus operandi, the reel appears to get locked while in use. Its cast button is made of plastic and may not last with regular use. Reel is not smooth and sometimes, the line hangs when casting. How to Clean A Fishing Reel After Saltwater Use? How Should You Pass A Fishing Boat?